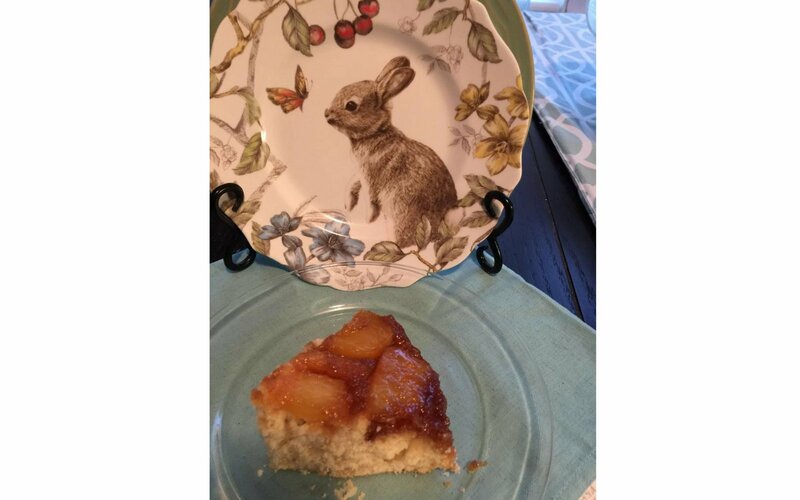 You are here: Home / Taste / Pineapple Upside Down Cake — A Welcome to Spring! Nothing says welcome to warmer spring days as a light dessert like the one I am baking today. 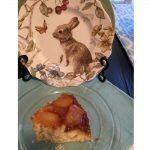 This has always been my traditional Easter dessert and is loved by all. 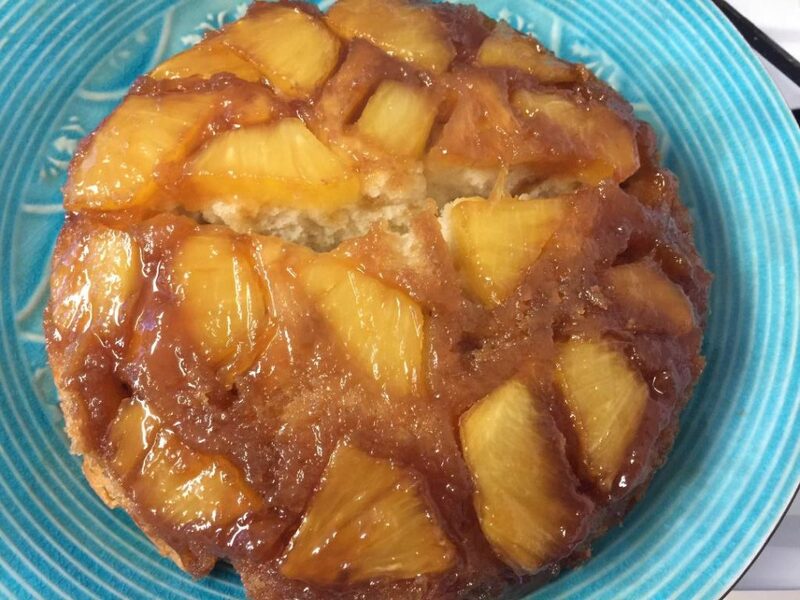 The pineapple against the sweet brown sugar will wake your taste buds up from their winter doldrums and say Spring Is Here! Pineapples were on sale in the grocery store this week and I just couldn’t resist it. I love the aroma and flavor of this lovely fresh fruit. This fruit is not easy to manage. Once you get the outer shell removed, you will want to clean up the pieces of any left over skin. Then you will want to slice them thin enough for the cake layer. This is approximately 1/4″ thick. You can make the slices thicker if desired. Also, because I used the fresh pineapple, I wasn’t able to collect any syrup. So I made my own. 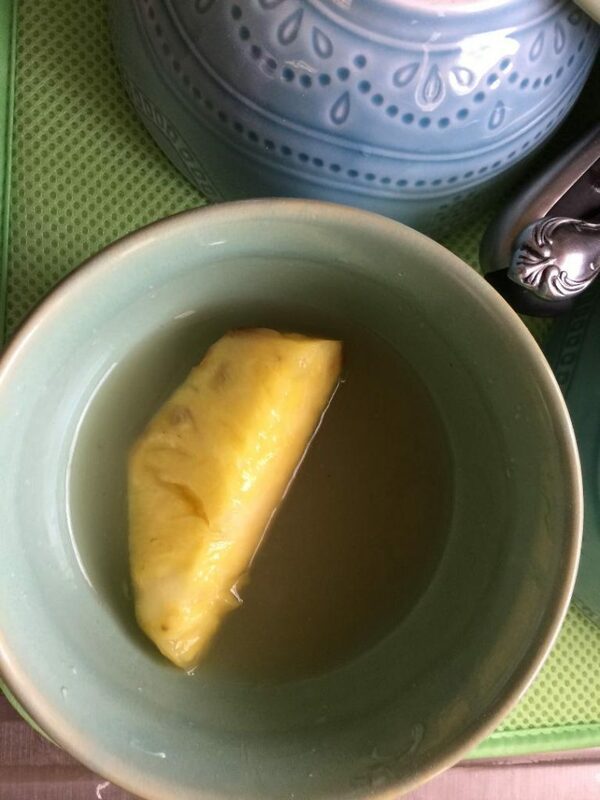 I took one of the larger pieces of pineapple and placed in a small saucepan. To this I added 1/2 cup water and 1 Tbsp. of cornstarch. Over medium heat, stir until the mixture thickens. Remove from heat and add 1 tsp. of sugar. Next, you will want to prepare you pan. I am using a cast iron skillet which is perfect for this recipe. I am covering the base with parchment paper so any oils from the skillet won’t seep into our cake. Place the 3 Tbsp. of butter in the skillet and put into the 350º oven. 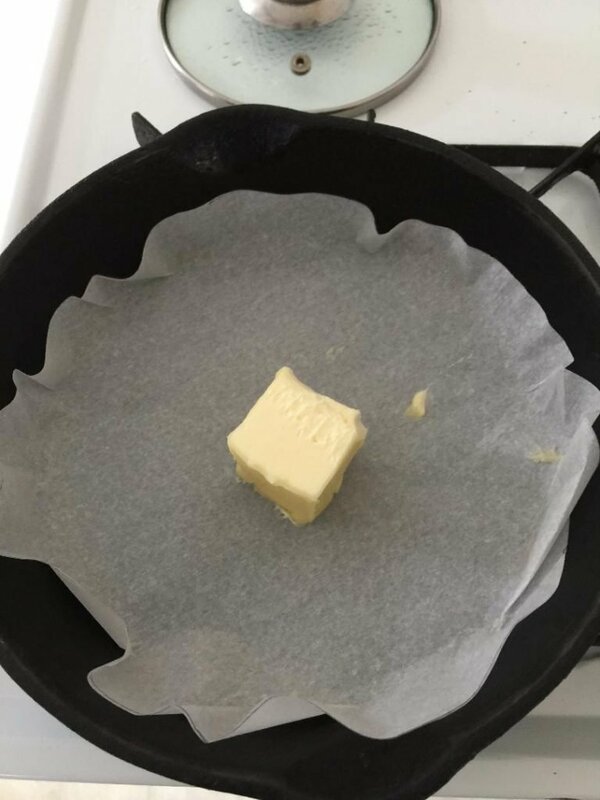 Once the butter has melted, remove pan and prepare for next layer. Take the brown sugar and spread evenly over the melted butter. I find that using a cold spoon works well. 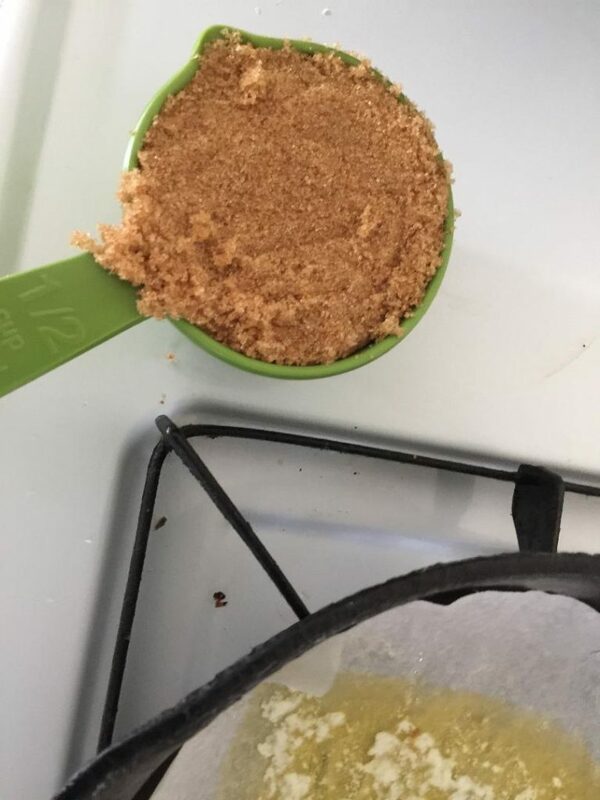 Incidentally, when measuring brown sugar, always make sure you pack it to the top. 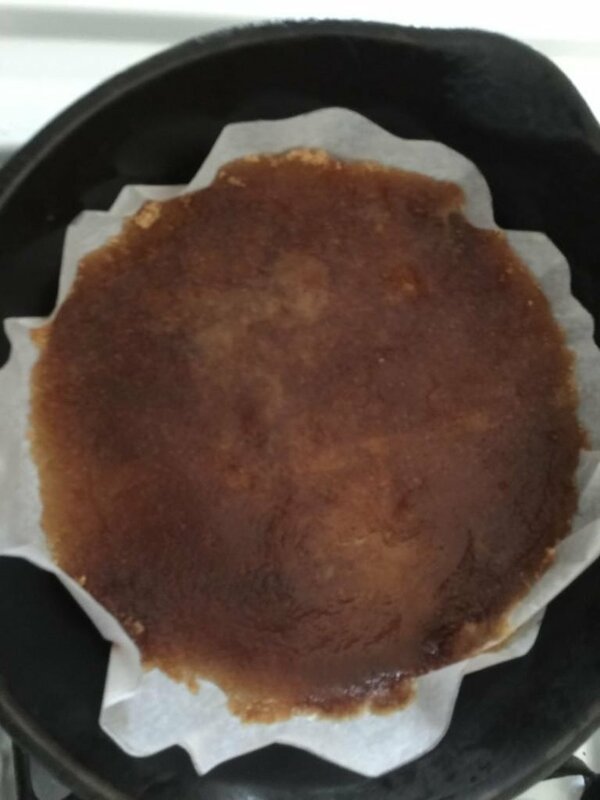 Once the brown sugar is spread, you can now place the pineapple slices over the brown sugar. There is no set order. Feel free to come up with a fun design. When you have completed this step, set aside the pan so you can move on the the cake batter. As with all my cake batters, I begin with creaming the sugar and butter. Add egg and vanilla mixing well. 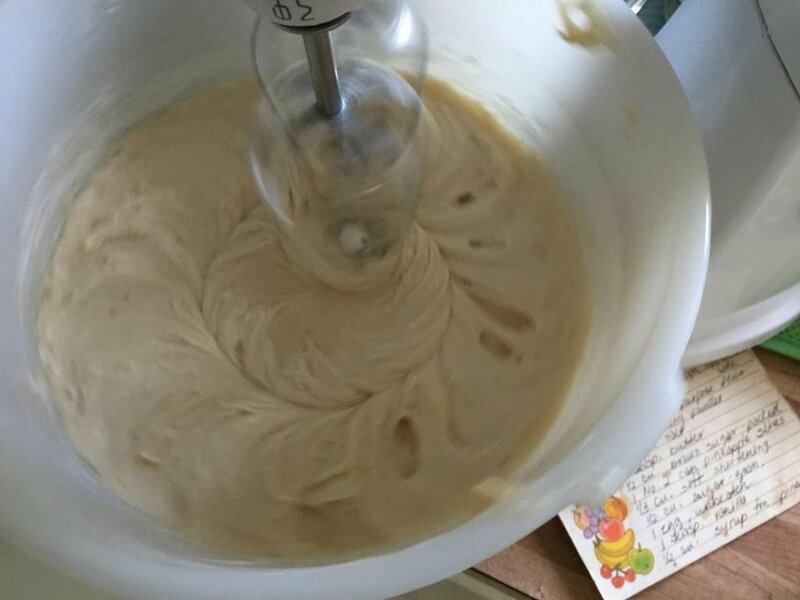 The final two steps are alternating the dry, flour mixture, and the wet, pineapple syrup. Mix well in between each addition. 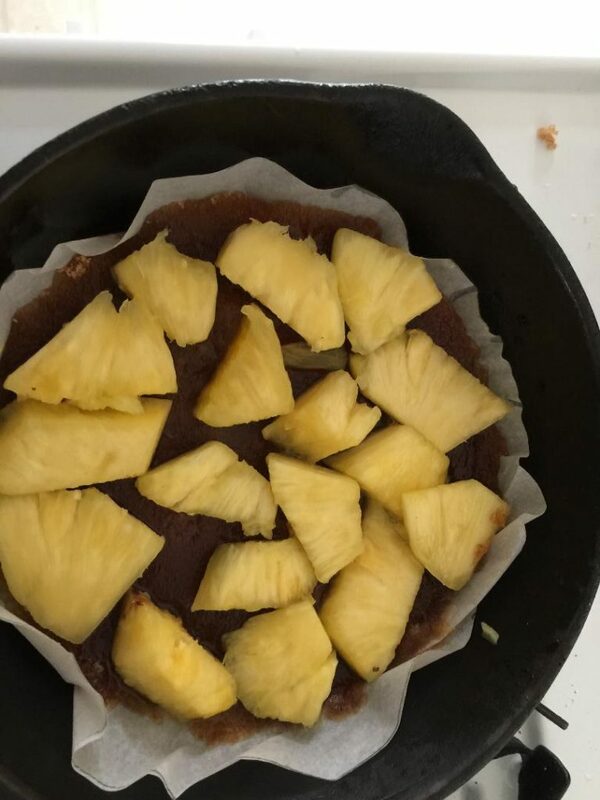 Once the batter is mixed, spread over your pineapples. 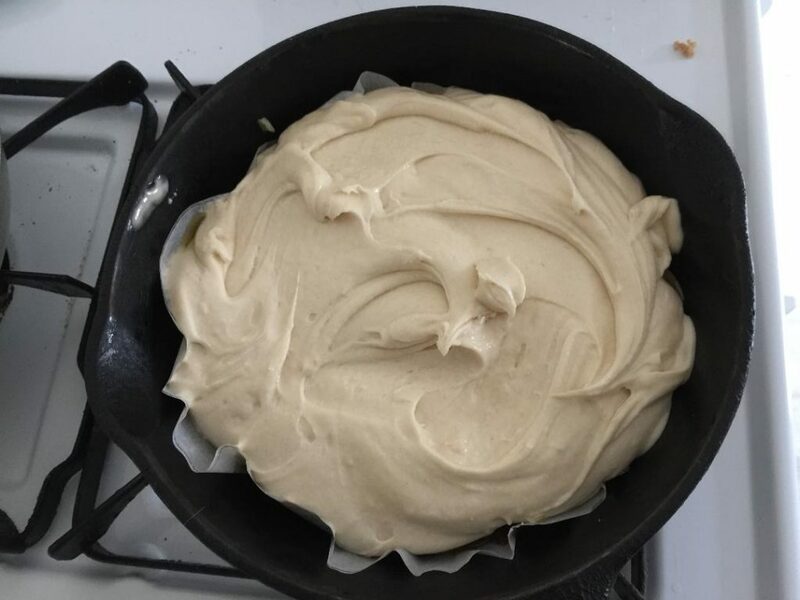 The batter is going to be thick so you may need a knife to spread it like icing. Bake for one hour. Once it is done, remove from oven and cool for ten minutes. Invert on your serving plate and be prepared for your guests to beg for more! Place a 8X8X2 cast iron skillet or cake pan in oven with 3 Tbsp. butter until butter is melted. 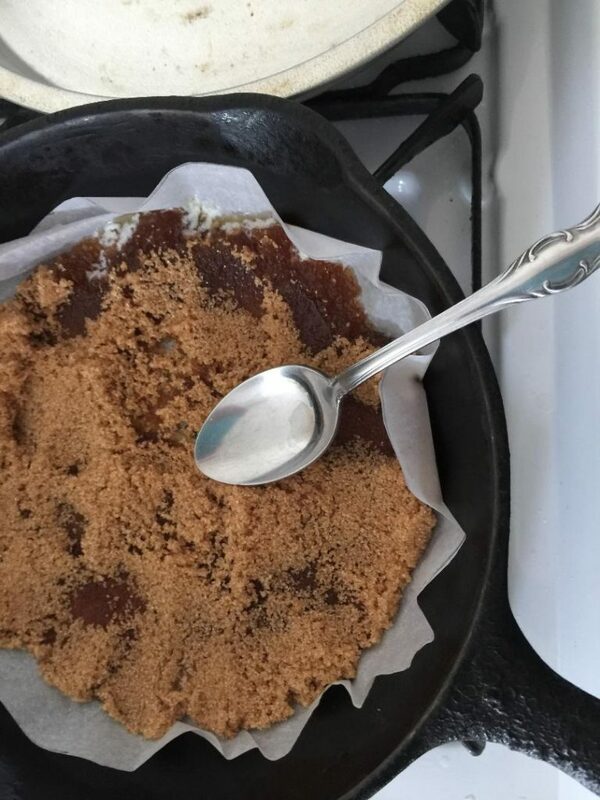 Remove skillet and add brown sugar, ensuring that entire surface is covered. 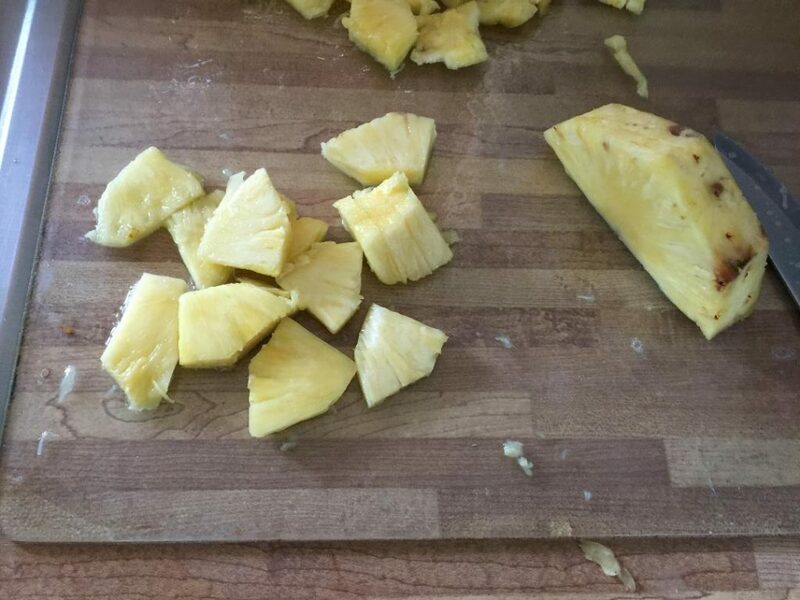 Arrange pineapple slices in pan. Cream sugar and butter in a mixing bowl. Add egg and vanilla mixing well. 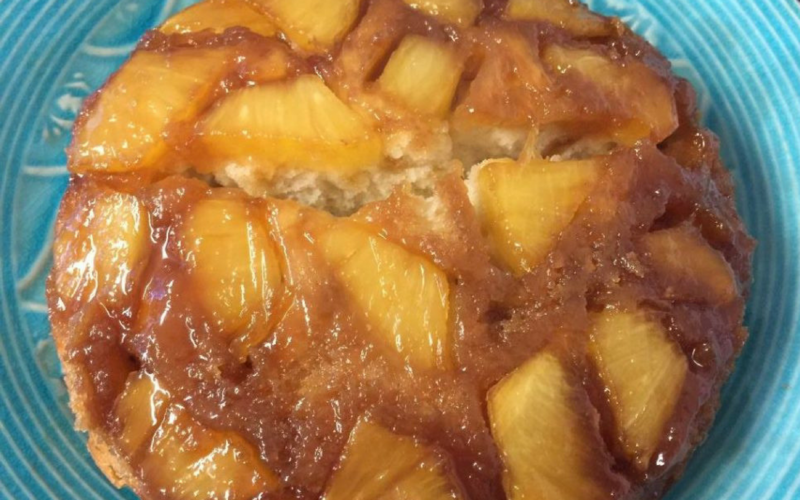 Alternately add flour mixture and pineapple syrup to the sugar mixture, mixing well between each addition. Cool 10 minutes then invert cake on serving dish.